Paris is known for its famous cafes, streets, bookstores and everything a traveler loves. If you are a romantic then Paris will surely be on your top destinations to visit. And when in Paris who could possible miss its roadside cafes, waffles and cigarettes. Paris has many cafes, there is a café on practically every street corner you turn or in every square you stumble across. 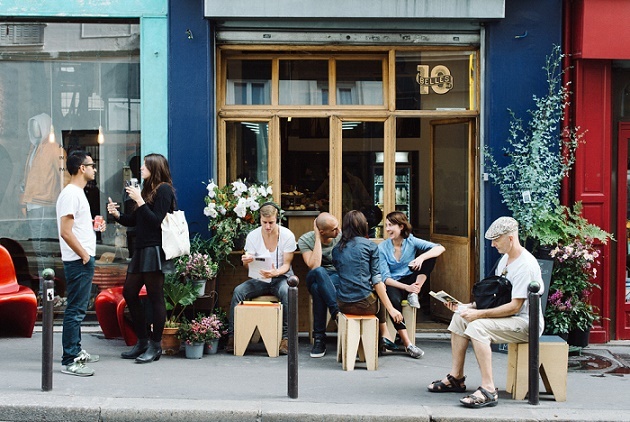 It’s easy to find a café in Paris, but it’s not always easy to find a good café. So, let's check out some of the cafeterias for the best coffees, teas, cakes and patisseries that the city has to offer. The Café de Flore is one of the oldest coffeehouses in Paris, celebrated for its famous clientele, which in the past included high-profile writers and philosophers like Georges Bataille, Robert Desnos, Léon-Paul Fargue, Raymond Queneau and Pablo Picasso. The café, which takes its name from the little sculpture of the goddess across the street, started out in 1887 as the workshop of the great French poet Appolinaire. It is located at the corner of Boulevard Saint-Germain. The nearest underground station is Saint-Germain-des-Prés, served by line 4 of Paris Métro. The coffeehouse still remains a popular hang-out spot for celebrities and its status attracts numerous tourists. The café has a very extensive drinks list with wine prices starting from 35 €/bottle. There’s a selection of teas starting from 5.40 € and all the usual coffees from 4.10 € upwards. The breakfasts at 25 € are comprised of a hot drink, patisserie and fresh fruit juice. 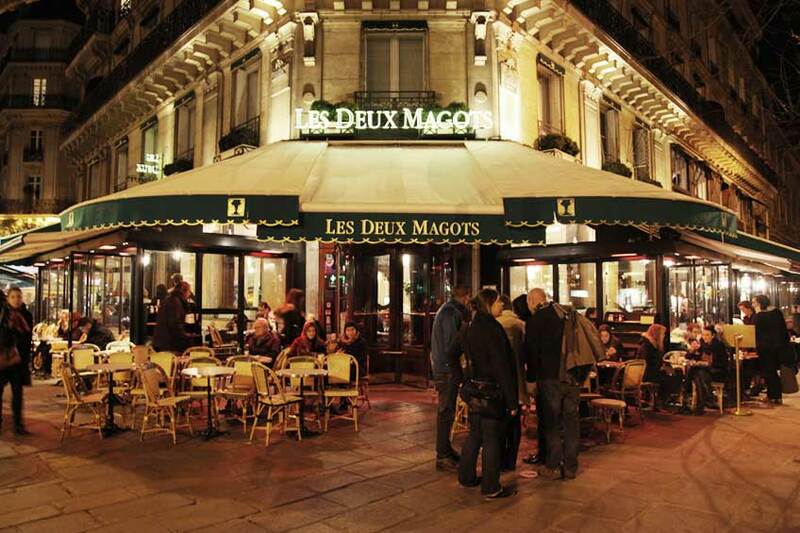 The next-door-neighbour of Café de Flore is Les Deux Magots. It is another of Paris’ classic cafés and a popular tourist destination. Its historical reputation is derived from the patronage of Surrealist artists, intellectuals such as Simone de Beauvoir and Jean-Paul Sartre, and young writers, such as Ernest Hemingway. The cafe also gives away a literary annual prize, The Deux Magots literary prize has been awarded to a French novel every year since 1933. The café has a full bar, including cocktails, and the coffee prices start at 4.40 €. One thing which is a must try is the café’s famous old style French hot chocolate at 7.30 €. The cafe has an exclusive selection of tarts, cakes or Pierre Hermé macarons for those with a sweet tooth. This is a rather new cafe started by Thomas Lehoux in September 2012. It’s a tiny place with simple pinewood décor, a snug mezzanine, cute fold-out stools and ‘real’ coffee. It took off immediately and enjoys a constant flow of coffee-loving customers since then. Food-wise, aside from the fabulous cakes, you’ll find a lunch menu consisting of sausage rolls, sandwiches and salads with prices ranging from 5€ to 7.50€. It is on the main street running alongside Canal Saint Martin, Paris, France. Shakespeare and Company is the name of two independent English-language bookstores that have existed in 37 rue de la Bûcherie 75005 Paris, France. It first was opened by an American, on 19 November 1919. During the 1920s, Beach's shop was a gathering place for many then-aspiring writers such as Ezra Pound, Ernest Hemingway, Djuna Barnes, James Joyce and Ford Madox Ford. 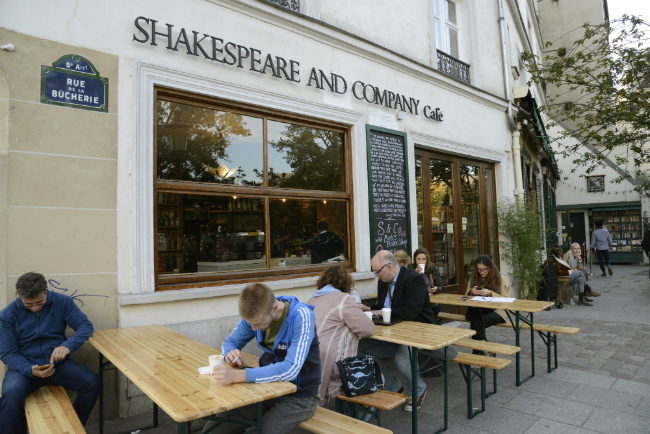 Shakespeare and Company Café is located right next to the bookshop, with large picture windows that look onto Notre-Dame and the quintessentially Parisian park of St.-Julien-le-Pauvre. With indoor and outdoor tables, the café serves coffee, tea, and fresh-squeezed juices, as well as organic, largely vegetarian food—including its famous lemon pie. Shakespeare and Company Café is run in collaboration with Bob’s Bake Shop.